Businessman clicking Net Worth button. Sometimes our inner Jerry Maguire screams “Show me the money!” so loudly we can’t help but listen. So, we listen, but then have no idea what to do next. How does one find “the money” when we feel like we’re strapped for cash as it is? Many Americans live paycheck to paycheck. In fact, according to a 2017 poll, 78 percent of full-time workers live this way. And, it’s not just the folks in lower-income brackets. Nearly 1 in 10, Americans making six figures also reported they live paycheck to paycheck. So, what gives? Since income isn’t always the issue, then what is? 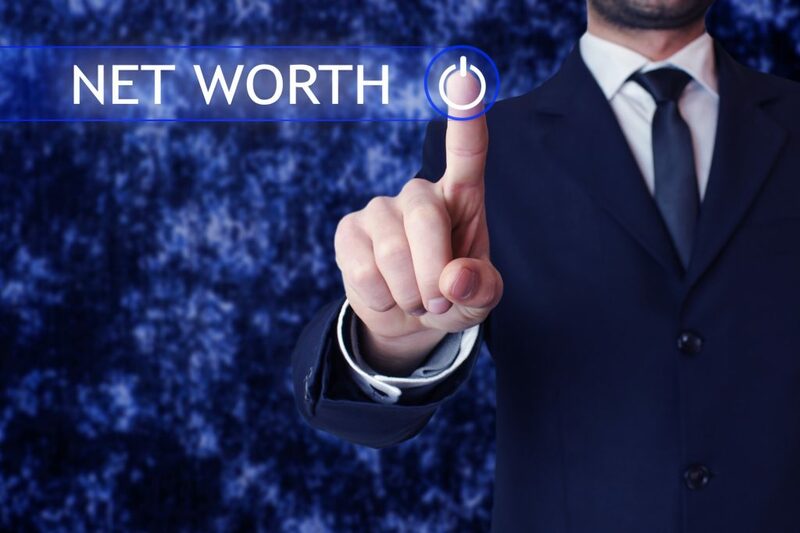 If you found yourself in this position and want to increase your future net worth, then this article is for you. Read on to discover five effective ways to increase your net worth so your inner Jerry can calm down. Financial discussions can feel daunting. But, the more we face these discussions head-on, the more we can improve our finances. Explore the following ways to improve your finances by increasing your net worth. The most vital step in increasing your net worth is seeing where you can save a buck. Especially, if you’re in the paycheck to paycheck cycle and living with debt. Try to cut down on your expenses as much as you can. Swap out your morning coffee run for homemade coffee. Use coupons and always stick to your monthly budget. Your net worth is the total of your assets and debts combined. Paying off debt like loans, credit cards, and mortgages, therefore, can help you to increase your net worth. Start by paying off loans with the highest interest rates or the lowest loan amounts. Refer back to your budget and pay as much as you can towards debt payments. Be sure to check with your lenders prior to making extra payments, however. Some loans such as mortgages charge fees for paying off the loan too quickly. Max out your 401(k) spending. In 2019, the employee contribution limit is $19,000 of pre-taxed income. The company you work for may also match your contribution up to a percentage of your total salary. Make sure to at least contribute this percentage into your 401(k). Money sitting in an interest-free account is money not fully serving you. Instead, invest your money into real estate, the stock market, or a retirement account. Beware some investments are riskier than others. Assess your investment risk tolerance before diving in head-first. Many successful investors have also developed investor strategies like Joel Greenblatt’s “Magic Formula Investing.” So, how rich is Joel Greenblatt? Let’s just say, his investment strategy is certainly working for him! Find a reputable mentor if you can and follow their lead! Everyone’s financial situation is different. Generic advice is a good start, but asking for help from a financial professional may be exactly what you need. Especially, if you feel like there’s no way to cut back on expenses or lower your debt. Never be afraid or embarrassed to ask a financial advisor or accountant to look over your finances with you. If anyone can help you increase your net worth and set new financial goals, it’s them! Excited to Increase Your Future Net Worth? Increasing your future net worth is a challenging task, but it’s not impossible! Be patient and give yourself time and space to improve your finances. Set long-term goals and work month-by-month and day-by-day to set yourself up for success. Want to increase your net worth by investing in cryptocurrency? Check out our blog post to learn how to invest in cryptocurrency in 2019.